Is important to us that your unit operate efficiently before the cold season. Our Service technicians can help you get your system up and running quickly. We understand that, and will work to get your heat restored rapidly and at a reasonable cost. If you’re not sure if you need heating repair services, some things you may want to consider are if your heater is blowing cold air, your heater will not turn on, your heater is making loud noises, and if your energy bills have increased. If so, it’s probably time for heating repair or a seasonal heating tune-up. We know what it feels like when the temperature in your home is unbearably cold. We also know it can be dangerous for you and you entire family. We’ll do whatever it takes to restore the heat in your home so you and your family can be warm, comfortable, and safe again. Give a preventive maintenance to your system before it reaches the cold season should be your priority. One of the best suggestions is to have one of our trained technicians out to your home before the weather gets to be cold enough that you need a heater. Our technicians have years of experience working on every make and model heater, including gas and electric models. While you don’t need the heat throughout the year, you certainly want it once the temperatures drop. To avoid any discomfort, you need to have a reliable company that will come out and service your heating unit. We offer many flexible financing options so there is always a plan to fit your personal needs. We offer various energy efficient heating systems from top brands and on all new products, we register all warranties for you. Your comfort is important. If you don’t have a heater in your home and a new one needs to be installed. Contact us today and we’ll give you a free estimate on a new unit as well as installation so you don’t have to go through the cold months without any heat. Our solution for single or multiple zones is a Mini-Split System offers a versatile, energy-efficient way to heat and cool a single or multiple rooms. No matter which unit you select, you’ll enjoy the benefits of a multi-speed fan and a wireless remote on a high efficiency system that will pay by itself after a few years of operation. Contact us today! We offer General Contractors, Custom Home Builders and individual home builders a complete installation/repair of air conditioning and heating systems. 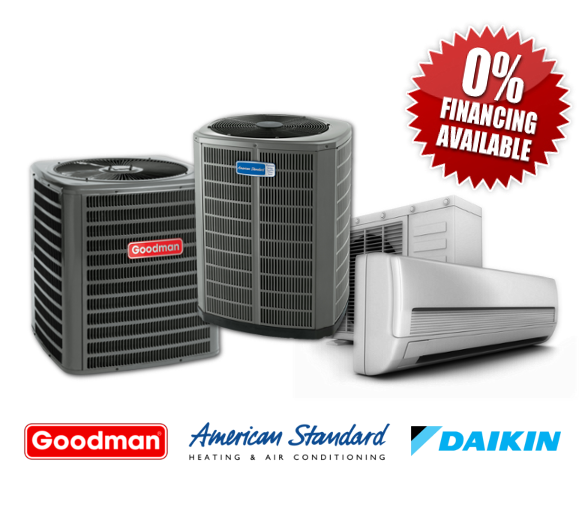 All heating and air conditioning systems are designed according to the latest standards set by ARI (Air Conditioning Refrigeration Institute) and Manual “J” load calculations, published by the Air Conditioning Contractors of America. Capable of either plan/spec or design build projects. Experienced installers/finish projects in efficient timely manner. Well stocked warehouse and vendors to better serve your time frame needs. Knowledgeable manpower to manage your projects from start to finish. On-site daily supervisors on all projects. New Construction from ground up. New Construction Tenant Finish Out.